From 1890 through 1916 the Navy carried harbor and other subsidiary service vessels (including former combatants) under the category "Unsuitable for War Purposes," previously "Unfit for Sea Service." In 1920 this category was renamed "Unclassified" and the Bureau of Construction and Repair filed correspondence concerning them under the file symbol IX. The IX numbers became official hull numbers in 1941. During World War I the Navy temporarily acquired eight coastal and river passenger steamers that served as training ships, local transportation vessels and stationary berthing or hospital hulks. In peacetime these would probably have been classified as "Unsuitable for War Purposes" or, later, "Unclassified." The lists below include these eight ships, all of which were near or over 1000 gross tons. Not covered are the many smaller coastal, river and sheltered water passenger steamers as well as many other subsidiary service vessels that the Navy also had in service during this time. 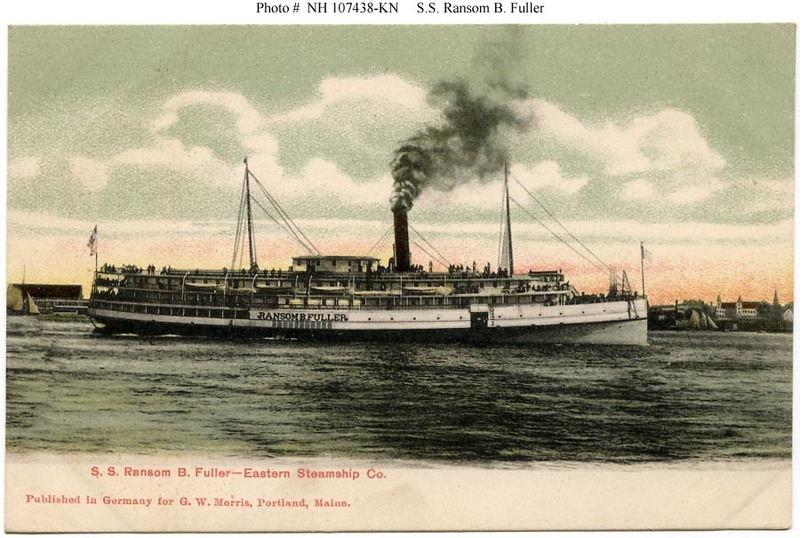 This page features larger coastal and river passenger steamers that were employed by the World War I era U.S. Navy for subsidiary duties. Where available, a photograph of each ship is also provided. EIGHT SHIPS with typical American coastal and river passenger steamer characteristics: VERY LONG SUPERSTRUCTURES and ONE or TWO SMOKESTACKS. They are subdivided below into two sub-groupings. Click the small photographs to prompt a larger view of the same image. 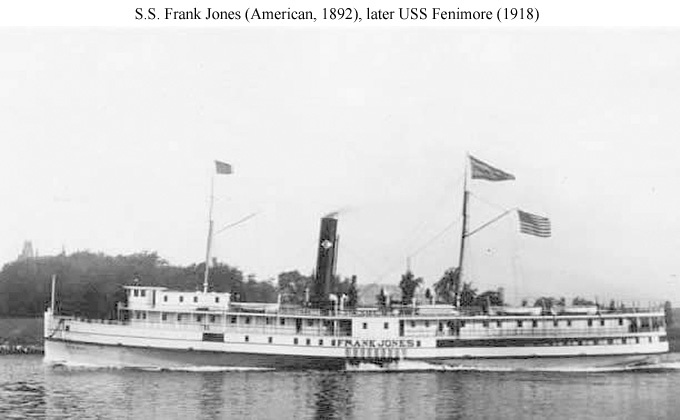 Fenimore, USN 1918-1918 (ex-American S.S. Fenimore, 1892). Side-Wheel Steamer, ex Frank Jones 1916. Used for coastal transportation. Burned at York, Va., 21 June 1918. Ransom B. Fuller, USN 1917-1918 (ex-American S.S. Ransom B. Fuller, 1902). Side-Wheel Steamer. Used as a barracks ship at New London. 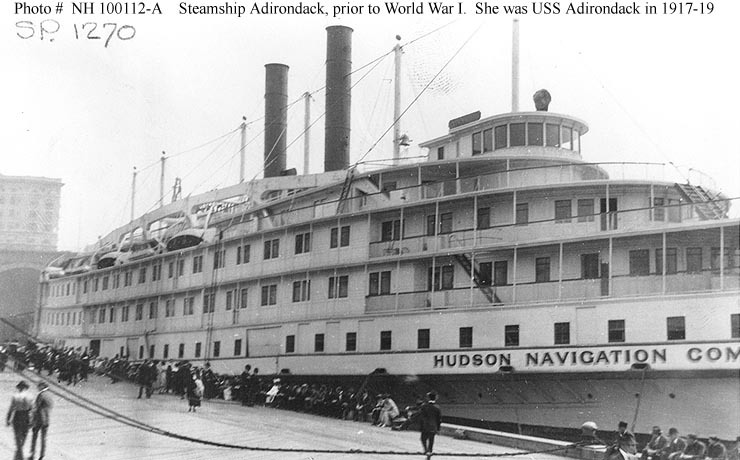 Adirondack, USN 1917-1919 (ex-American S.S. Adirondack, 1896). Side-Wheel Steamer. Two tall thin smokestacks. Employed as a barracks ship at the New York Navy Yard. 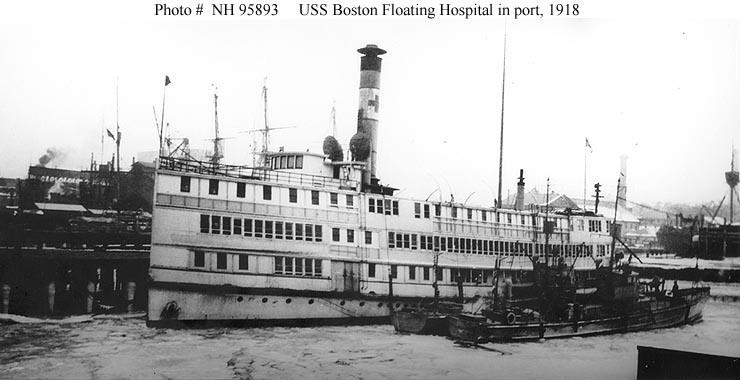 Boston Floating Hospital, USN 1918-1918 (ex-American S.S. Boston Floating Hospital, 1906). One tall thin smokestack. Employed as a stationary hospital ship. C.W. Morse, USN 1917-1919 (ex-American S.S. C.W. Morse, 1903). Side-Wheel Steamer. Two tall thin smokestacks. Employed as a receiving ship. 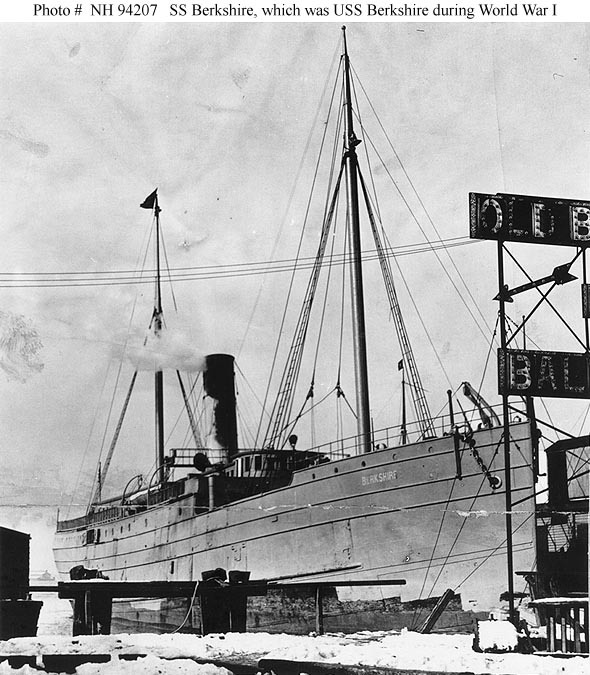 Iro, USN 1918-1918 (ex-American S.S. Iroquois, 1889). Side-Wheel Steamer, ex Kennebec 1912. Used in the Chesapeake Bay area. Also recorded as commissioned 19 Apr 18. No image is available of USS Iro. 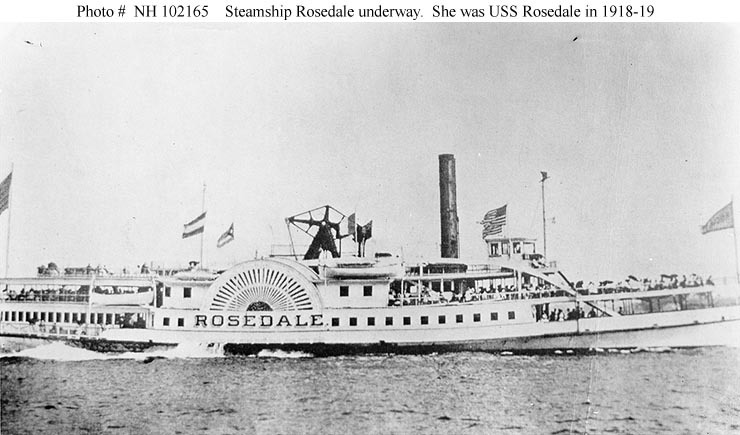 Rosedale, USN 1918-1919 (ex-American S.S. Rosedale, 1877). 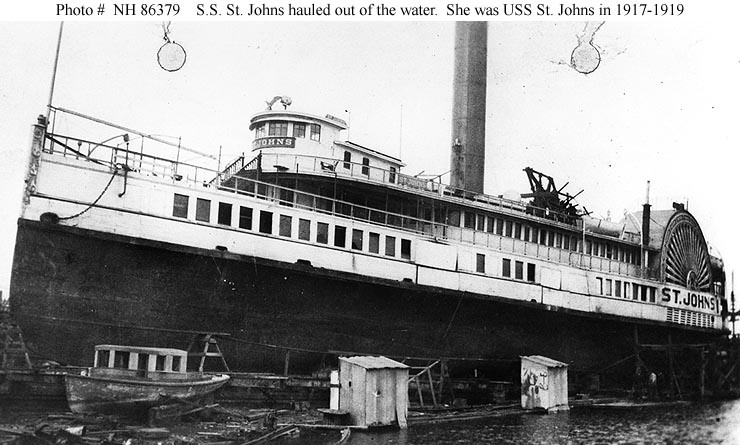 St. Johns, USN 1918-1919 (ex-American S.S. St. Johns, 1878).